This building was constructed around 1925 by John and Mary Rudge together with a nearby gas station called Jack’s Place. 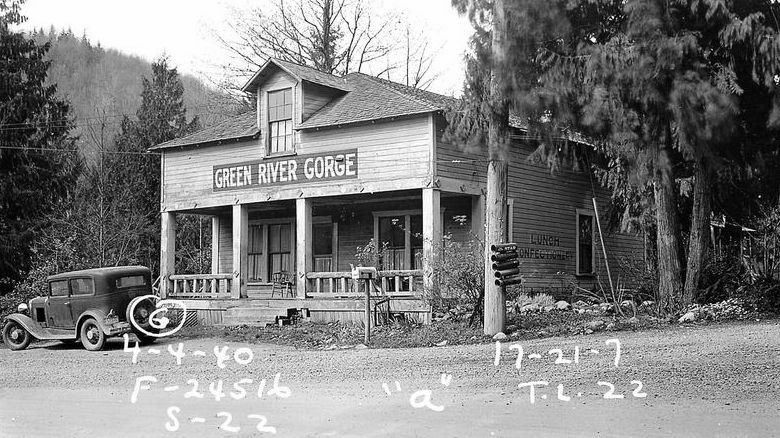 This 1940 photo shows a resort building located above the Green River Gorge on the east side of the historic, single-lane bridge that now connects the Green River Gorge Road to the Enumclaw-Franklin Road. This building was constructed around 1925 by John and Mary Rudge together with a nearby gas station called Jack’s Place. In 1921-22, the Rudges had purchased two parcels totaling 13 acres for $1,860. John Rudge was a Welsh coal miner from nearby Cumberland. In 1921-22, the Rudges had purchased two parcels totaling 13 acres for $1,860. In 1933, William Weimer, a retired investor living in Enumclaw, took a mortgage interest in the property. Weimer was an early pioneer for whom a nearby King County road was named in 1905. When Weimer died, his mortgage interest was willed to the Catholic Church. The Rudge property was subsequently sold by the Catholic Church to R.C. and Anne Kelley of Enumclaw, who owned the resort property for a number of years. The building featured in this photo was torn down in April 1950. The following description of Rudge’s resort comes from Louis Jacobin’s 1925 promotional brochure, A Glimpse of a Charmed Land. The vale above the gorge is also a wonderland, particularly that part of it known as “Rudge’s Green River Gorge,” with its neat hotel, service station, fine cabins, superb parking grounds and ample and modern conveniences for picnic parties, camping parties, playgrounds for children and private dancing auditorium and reception rooms. Rudge’s place is a grassy haven beneath the sheltering boughs of beautiful forest trees by the side of mountain streams and cool spurting fountains, and right by the side of the main public highway which leads away through forest edens, rural gardens, and on into the most enchanted wonderland ever claimed by civilization. 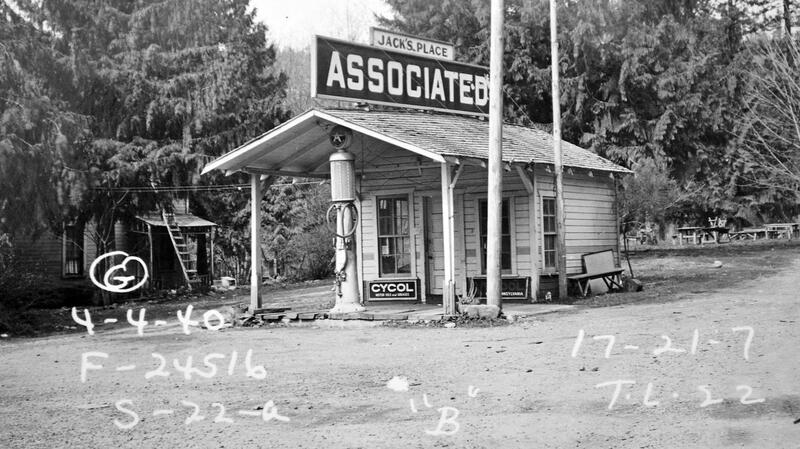 King County Assessor photo of tax parcel number 172107-9022 dated April 4, 1940.